Papers that do employ these reporters – who are tasked in part with interpreting the decisions and policies of Washington for readers back home – are not clustered in any one part of the country, but rather are spread out around the United States. But 21 of 50 states do not have a single local daily newspaper with its own dedicated D.C. correspondent accredited to cover Congress. While these 21 states tend to have smaller populations and thus small congressional delegations, there are notable exceptions. Arizona and Indiana (both with a nine-member delegation) have no local paper with its own dedicated D.C. correspondent. There are other means by which a local paper can access regional coverage of Washington, however. Here, the Washington bureaus of large newspaper companies play a key role. For example, according to SEC filings from 2014 – the year the Senate Press Gallery list was published – McClatchy owned papers in 14 states and had 36 reporters accredited by the Press Gallery, some with regional assignments. 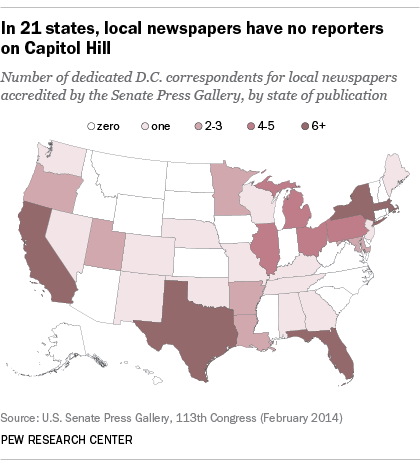 Gannett owned papers in 30 states and had 18 reporters accredited to be on the Hill. The specifics of these regional assignments are not listed in the Press Gallery. But additional research suggests that while some of these correspondents at corporate bureaus focus on a specific state (for instance, one of McClatchy’s D.C. correspondents covers immigration, labor and North Carolina), others are spread across multiple papers in several states (one Gannett correspondent describes her beat as encompassing Tennessee, South Carolina, Alabama, Virginia and North Carolina). Traditionally, news organizations around the country sent their own reporters to Washington to keep tabs on their elected lawmakers and find out how readers would be locally affected. But declining revenues and budget cuts have forced changes to this approach. For those whose job it is to translate Washington for communities outside the Beltway, the trend is troubling. “It is only the regional media outlets that keep close ongoing tabs on lawmakers, politicians, lobbyists, issues, interest groups from discrete geographic areas, and as the number of regional reporters has dwindled, that watchdog function has absolutely been watered down,” said Todd Gillman, Washington bureau chief for The Dallas Morning News. Another 14 states have just one D.C.-based correspondent from a local newspaper, according to the 2014 Gallery. And that list includes Washington state, with a sizable congressional delegation of 10 members, whose lone D.C. correspondent has since left The Seattle Times with the closure of the paper’s Washington bureau. That leaves a total of 15 states with multiple local newspaper reporters (two or more) stationed in D.C. to cover Washington on residents’ behalf. Massachusetts, a state with a nine-member delegation, stands out here for having eight D.C.-based newspaper reporters accredited to cover Congress, all of whom work for The Boston Globe. New York and California are both large states with major media markets. While they are listed as having dozens of D.C.-based newspaper reporters, the numbers include not just reporters covering local delegations, but also national and political affairs for papers such as The New York Times or Los Angeles Times. For this reason, the numbers here may actually overstate the extent to which these two states are served with localized coverage of the federal government. Amid the declines, there are a number of newspapers that have reestablished a Washington presence. A few public radio stations, such as Alaska Public Radio and St. Louis Public Radio, support a D.C. correspondent. And a handful of young digital news outlets, such as The Texas Tribune, MinnPost and Connecticut Mirror, now do the same. But for now, at least in sheer numbers, they are not enough to fully replace what has been lost over the years. Note: California and New York D.C. reporter numbers include The Los Angeles Times and The New York Times, both of which include not just reporters covering local delegations, but also those covering national and political affairs. Corporate D.C. bureau numbers include newspapers owned in 2014 by McClatchy and Gannett and those owned by Hearst in 2015.